Have a read and take part if you can. Interesting! I've heard a little about the microplastics problem, but haven't looked into it too much. Will now though! the article fails to tell me what the micro plastic is harming? 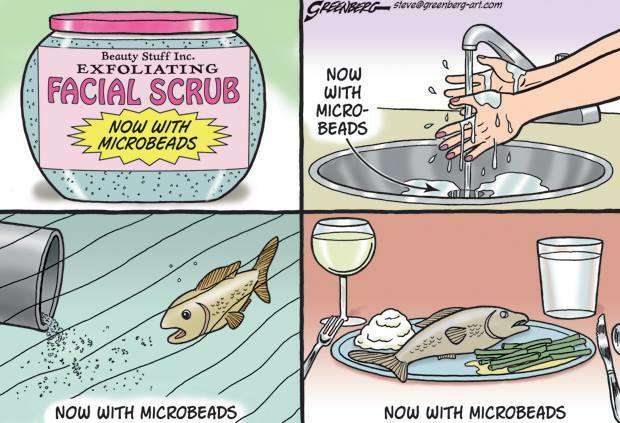 The basic problem is that water treatment plants can't/won't/don't filter the micro beads well, for a variety of reasons. So, they end up in the waterways, lakes and oceans. There, they are consumed by small marine life - krill, shrimp, etc - where they choke on them and die in large numbers. This is problematic for a variety of reasons, not the least of which is that larger species eat smaller ones and if there are fewer smaller ones, then you have fewer larger ones. Another issue is that the plastics, because of their durability, bio-accumulate. These plastics leach chemicals used in their production -the most problematic of these being PCBs, DDE and various phthalates - which are known carcinogens aside from whatever other physiological affects their consumption entails. Point is, it's not as benign as one might initially suppose, and we don't have a good understanding of the magnitude of the issue. The micro beads have been turning up in a bunch of surprising places, which what this research aims to find out. Seems like something we as overlanders could easily do. Plenty of space to carry water samples as we travel and easy to take the time to catalog everything.